The Oklahoma City Thunder defeated the Atlanta Hawks 113-94 Sunday afternoon in Tulsa at the BOK Center to conclude game three of preseason basketball. The Hawks came out firing taking an early 12-5 lead by the seven-minute mark, and the Thunder saw a messy first half not finding the lead until close to the end of the first quarter, which was immediately taken away after a 3-point buzzer beater from DeAndre’ Bembry to extend the Hawks lead to 29-26 going into quarter two. Former Oklahoma Sooner standout Trae Young was welcomed back to Oklahoma with thunderous applause during player introductions, and Young finished the day with 16 points, two assists and one steal. Young’s matchup with Schroder, where Schroder played a full-court press on him, was a moment he noted during postgame. The Hawks are now 1-2 in preseason, while the Thunder advance to 2-1. 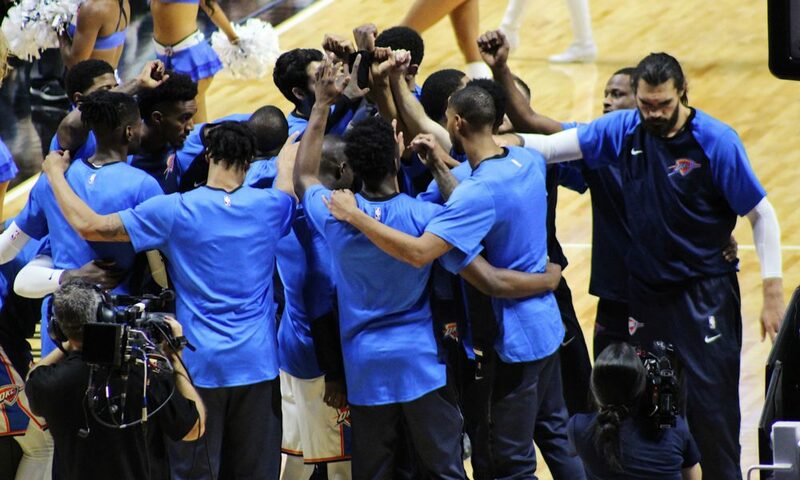 The Thunder will finish off preseason in Oklahoma City against the Milwaukee Bucks tomorrow night at 7 p.m., while Atlanta will return home to host the Spurs to conclude preseason. Watch below for a Thunder vs. Hawks wrap-up plus full postgame interviews from Hamidou Diallo, Paul George, Steven Adams, and Hawks guard Trae Young.